It can be very confusing sorting through the various types of hard, stone-like floor tiles available--so much so that the differences between terra cotta, quarry tile, ceramic and porcelain tile gets lost in the shuffle. Quarry tile is a hard, impervious paving tile made from the ground minerals formed and fired in much the same way as is used to make brick. They are typically harder than ordinary clay bricks, due to the minerals used and the high firing temperatures. Unlike clay terracotta, quarry tiles are not porous and will resist water; and unlike ceramic tile and porcelain, quarry tile does not have a surface glaze layer. Quarry tile a misleading name. The tiles themselves are not sliced from a quarry like granite slabs. Instead, minerals such as feldspar, clay, and shales (all of which may have been quarried) are ground together and then extruded into tile forms, then baked at high temperatures. Many commercial buildings use quarry tile because it hides stains well and is very durable. That doesn't mean that quarry tiles are limited to strictly functional, work-a-day spaces. Many homeowners install them when they want to add a unique, warm feel to certain rooms in the home. While you may not find quarry tiles in the bedroom, you can often find them in a sunroom, entryway, or even a kitchen. Ron Williamson at Metropolitan Ceramics tells us, "We often run into absorption confusion about quarry tile because it is so similar in looks to inexpensive red unglazed pressed tiles that are very high absorption." Quarry tile is sometimes confused with terra cotta, which does absorb water. Williamson further tells us that, at least in terms of his company's quarry tile, it is "fired at high temperatures reaching over 2,000 degrees F." This means that the tile is "low absorption and qualifies as vitreous." That last word is the most important. Vitreous--"glass-like"--means an absorption rate of 0.5% to 3%. This is just one level below the ultimate low absorption rate of "Impervious." In many applications, good-quality quarry tile does not require sealing, though it will never be quite as impervious to staining as a glazed ceramic tile. Generally, you will not find the 12" x 12" or larger sizes that you can find with ceramic tiles. Quarry tiles are most often found in the 6" x 6" size, but can range up to 8" x 8". Partially true. Quarry tiles are thick! Most quarry tiles are from 1/2" to 3/4" thick. But ceramic tiles are also found in thicknesses of between 3/8" to 5/8", as are some ceramic tiles. One distinguishing aspect of quarry tile is that it can have a rougher texture, which provides great traction for exterior applications. But you can also find quarry tile intended for interior use that is surprisingly smooth and welcoming to bare feet. No, sealing quarry tile does not change it's color or ruin it. In certain locations, in fact, sealing will prevent the tile from staining or discoloring. Main Interior Floor Areas: Some examples are living rooms, dining rooms, and kitchens. Interior or Exterior Walkways and Entryways: Because of quarry tile's high degree of slip resistance, it works well for any area where people need to walk--without slipping. It's also very durable and stands up to traffic well. Backsplashes: Despite the name, backsplashes typically do not receive much in the way of splashes from sinks. Thus, unglazed quarry tile can work well for backsplashes. One notable exception would be backsplashes near stoves, where stains from cooking grease and food may be a problem. Some Countertops: Heavily-used kitchen and bathroom countertops should not be tiled with quarry tile. However, side counters that are not areas for food preparation can be tiled in quarry tile. While not exactly representing all of the colors of the rainbow, quarry tiles can be found in a small variation of earthen tones, such as dark gray, light gray, tan, brown, and beige. Yet the most popular color of all? You guessed it. Red quarry tiles. 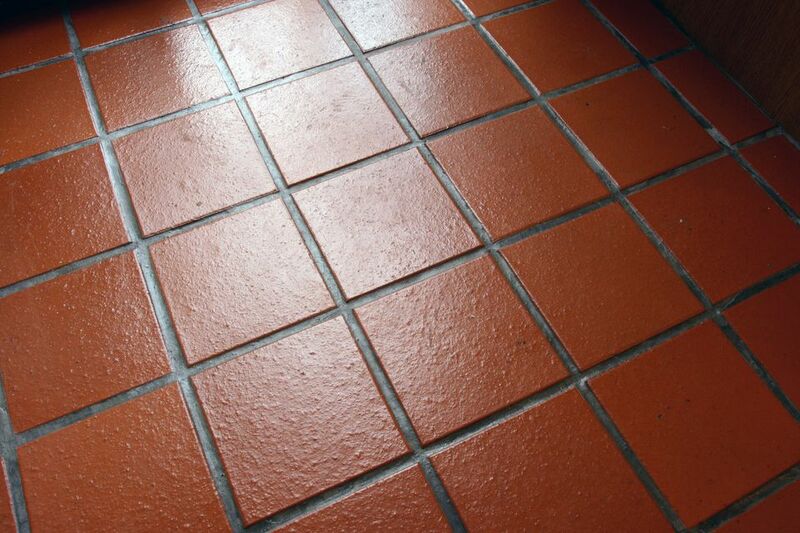 Red most closely approximates the color of the natural clays which comprise many quarry tiles. Not only that, red is the optimal color for hiding stains. Although it's sometimes advised that quarry tile should always be sealed, this is not necessarily true. Ron Williamson of Metropolitan Ceramics says that quarry tile from his company, "...can be sealed with a water-based penetrating sealer, which can help with some staining especially on the grout. It does not, however, have to be sealed." So, for normal wear, sealing is not required for this type of tile, but for abnormal wear (high traffic, oil, grease, etc. ), you may want to seal the tile. If so, you should use a water-based penetrating sealer. Metropolitan recommends against using a surface-type seal.